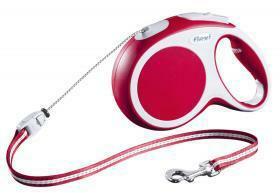 Flexi Vario 8 metre Long Dog lead. More dog owners can now benefit from the unique features of these premium cord retractable leashes with the introduction of the Flexi Vario Long (8m length). The prime feature of this range is the soft grip handle, which has now been cleverly exposed through the freestanding packaging so that the consumer can immediately feel the difference and discover why this leash gives total confidence. flexi Comfort.